You can get a signed copy from Laurelreedbooks (see info on right). Or deal directly with me at babineb@silomail.com. Soft cover $20cdn or Hard cover $30cdn plus shipping and handling. Contact me for more information. 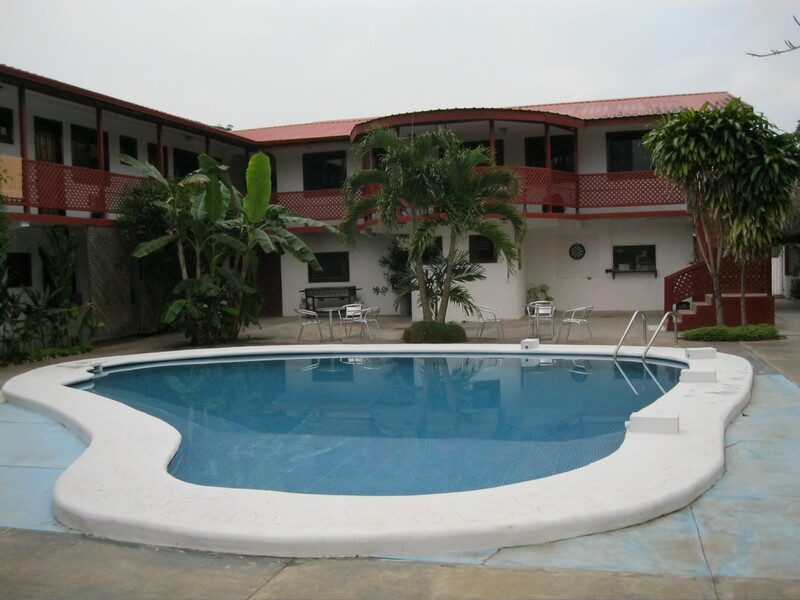 Now, picking up where I left off in Part 1 where we returned to the Aguada Hotel in San Ignacio for 10 days before heading out for Hopkins Village. 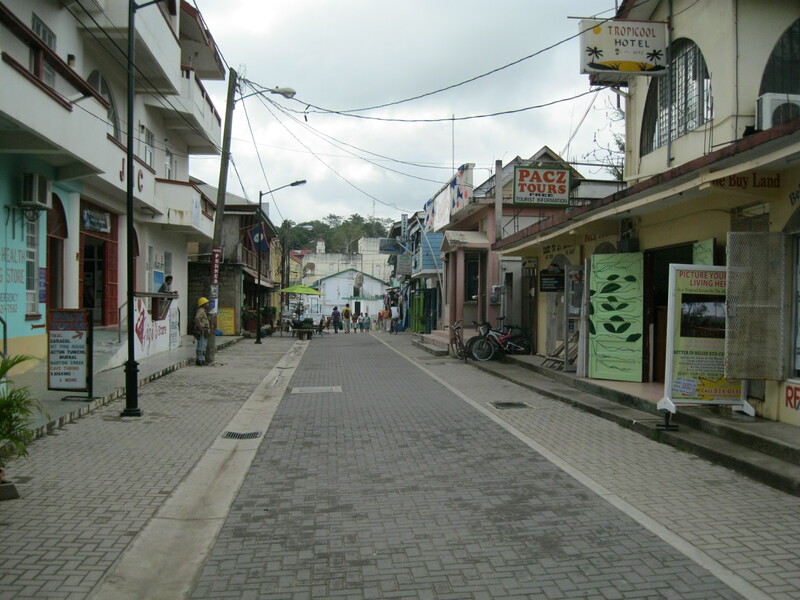 San Ignacio has improved over the years. It’s still a dusty cowboy town in many ways, stuck inland on the border of Guatemala and cradled by the rain forest. 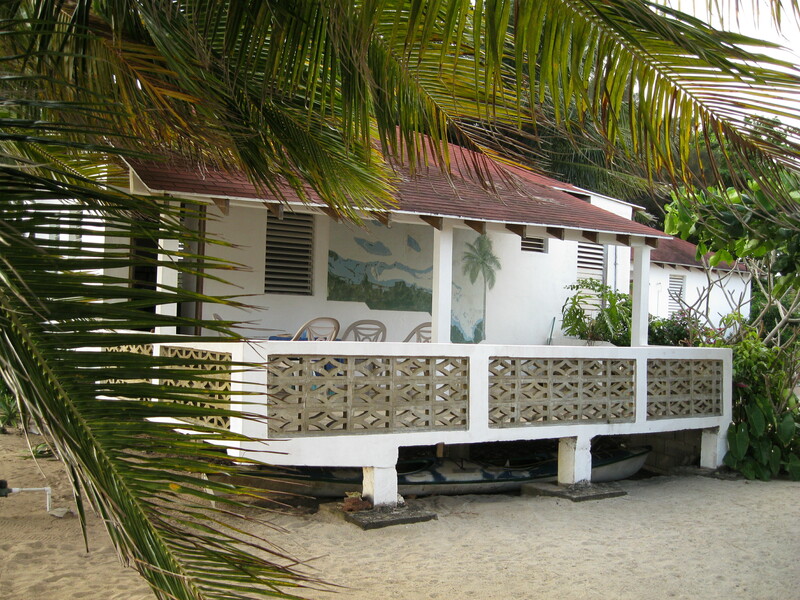 It has become the hub for ex-pats from Europe and especially North America who have bought land in the area and are experimenting with a self-sufficient life-style far away from the hustle and bustle of their home countries and from the encroaching tourism of much of the coast and cayes in Belize. From last year to this, the downtown has been changed dramatically. Early Morning on Burns Ave.
Burns Ave., the 3 block- long main drag, has been re-paved for pedestrian traffic only, a family-friendly park has just opened one block from Burns, the market place has expanded and is open 7 days a week and a new bus station is being constructed. Mr. Greedy’s Pizza, Burns Ave.
We will be back. 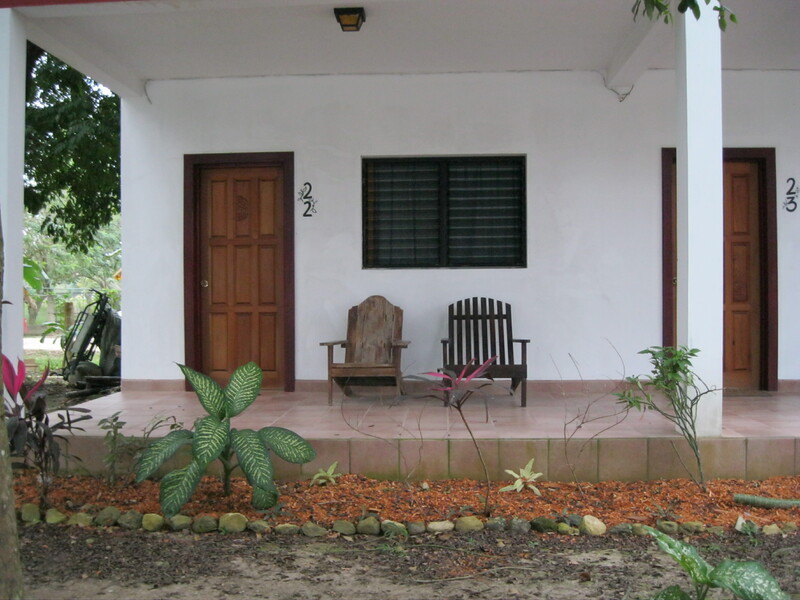 San Ignacio is part of our Belize. But now it is time to move on. Fond farewells. Eager anticipation. 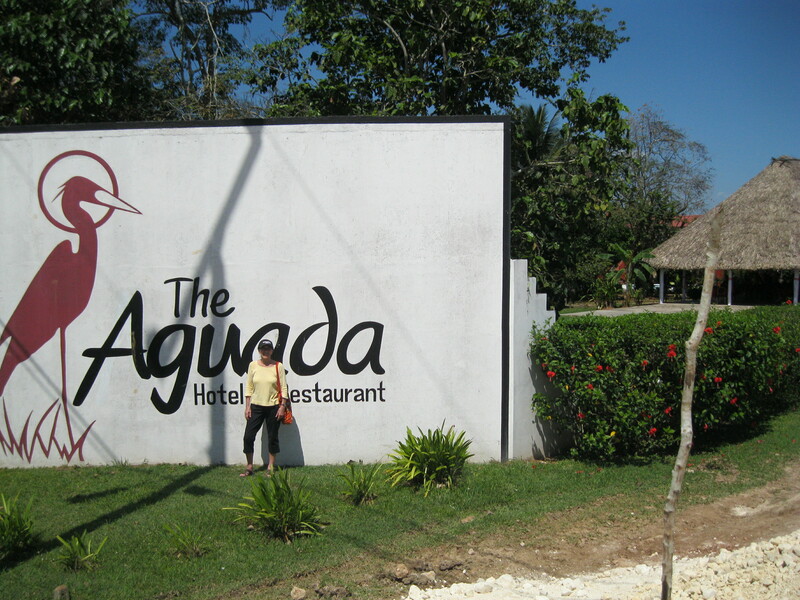 Tosh, the shuttle woman, will pick us up at the Aguada Hotel in the morning. 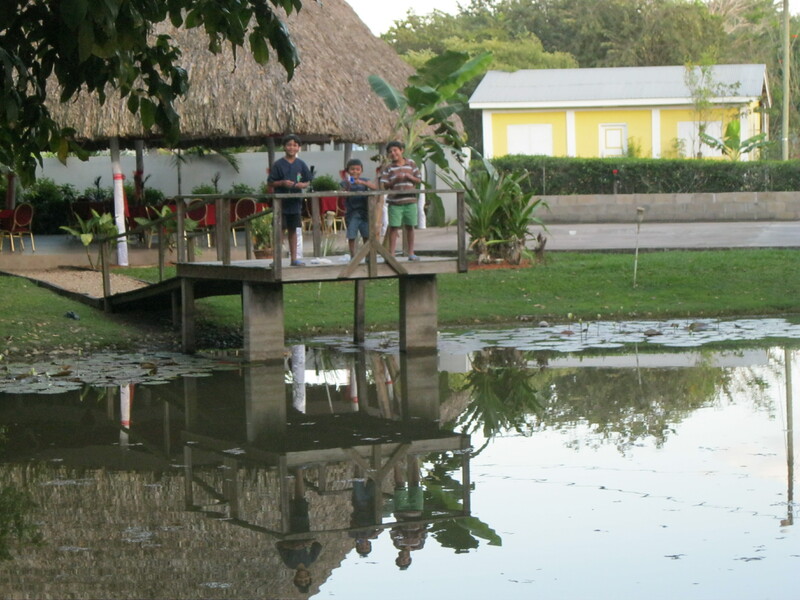 Rather than take a taxi to the bus station in San Ignacio to take us to Belmopan to catch another bus to Dangriga, we arranged for Tosh to pick us up and drive us to the bus station in Belmopan, the capital of Belize. 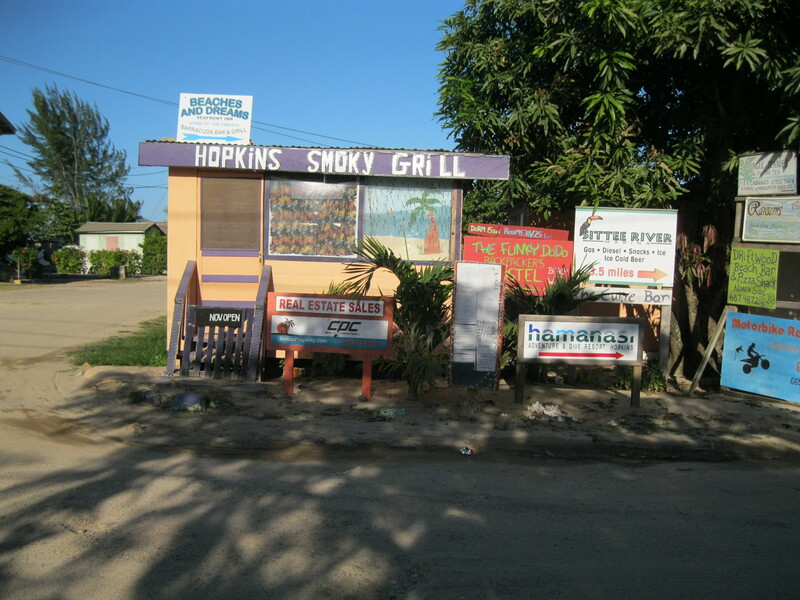 From there we would take the bus down the Hummingbird Highway to Dangriga and from there to Hopkins Village where we would re-unite with our friends and hosts at Hopkins Inn. And there we were next morning, whisking past Belmopan and taking the turn down the Hummingbird Highway, Tosh at the wheel of her shuttle van, two nice Canadians from Thunder Bay on their way to an island off the coast, and Brian and Evelyn in the back seat, enjoying the winding drive up and down the Maya Mountains on the Hummingbird Highway. 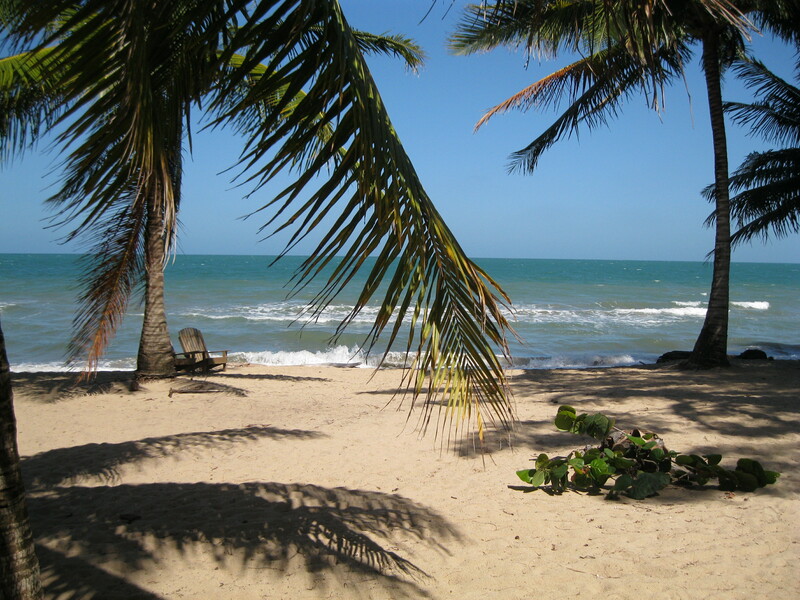 When Tosh drops off the Canadian couple in Dangriga, she turns around and says, Forget about Dangriga. I’ll just turn off at the Southern Highway and take you straight to Hopkins Village. Okay? Okay? You kidding me! Let’s boogie. It’s at least 20 miles out of her way, 20 more to get back to the Hummingway Highway. When we got to Hopkins and she drops us off, I have to negotiate against myself to get her to take anything more than the agreed fare to Belmopan. She drives a hard bargain and won’t accept anything more than a tip to defray her gas costs, which at $ 6.50 usd a gal. are crazy high. And then, there we were. Back in Hopkins Village and back at the Hopkins Inn. Our hosts and friends, Greg and Rita Duke, were there to greet us, as was Lucy their mongrel dog with traces of the Irish wolf dog in her. We’ve known Rita and Greg for more than 12 years, and I would like to think that while they will always be our hosts when we visit Hopkins Inn we have crossed the line and have become good friends. Back then, as now, Rita and Greg prepared a continental breakfast every morning and Rita herself served it to each of the occupied cabanas. It is and always has been a great way to start the day. 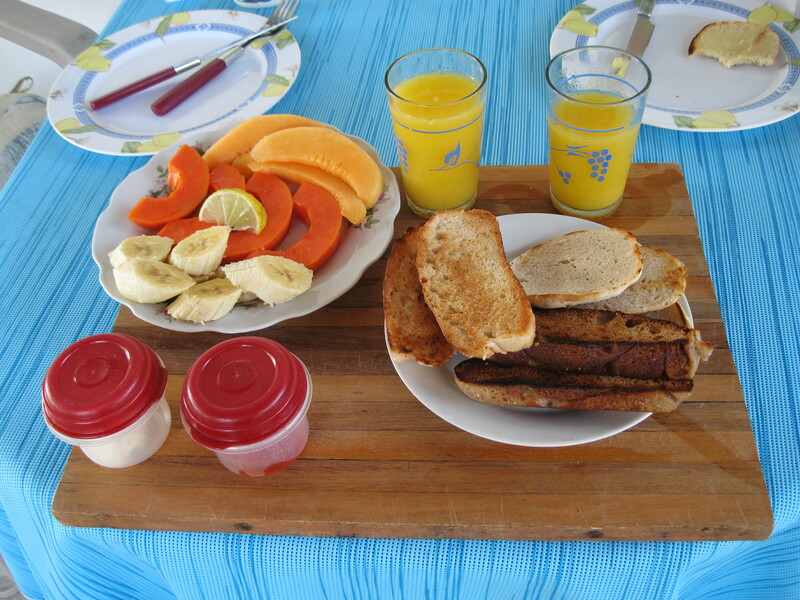 Breakfast consists of two or three different local breads, butter and jam, three different local fruits usually home-grown bananas, watermelon, papaya wedges and pineapple slices, plus pieces of cheese and at least once a week hard-boiled eggs. Plus freshly squeezed orange or grapefruit juice. Breakfast was/is part of the daily rate of the room. And add to this, an opportunity to chat with Rita when she delivers the food. Rita is very engaging , the more (greg)arious of the two. So this is how we began each morning. Up around 6:30 to 7:00. 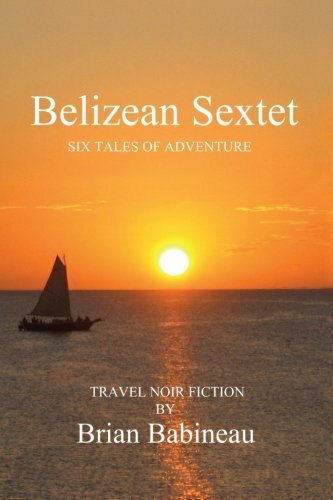 Look out the louvered window or step out on the verandah to watch the sun rising and the waves crashing ashore maybe forty feet away. I make coffee for both of us. After that there’s more coffee for me and Evelyn drinks tea. Somewhere around 8, Rita delivers breakfast and we sit out on the spacious verandah chit-chatting for a while. After breakfast, we might read for a bit. Evelyn has her Kobo and I have my Kindle as an app on my Asus tablet, so more likely I would read the Toronto Star to keep up on home current affairs. Then we head for the beach which, in our case, we are already on, since the cabana is built on it. There is nowhere in my experience a more idyllic place than the beach at Hopkins Inn. It is post-card perfect, what with the sea, the sun and the sand juxtaposed under creamy clouds and a bright blue sky, and a slight breeze wafting the leaves of the palm and coconut trees. Then we wade into the waves crashing on shore, making sure we do the sting-ray shuffle as we enter the water. The small 12-14 inch sting-ray likes to come close to the shore line seeking warmer water. Greg and Rita taught us long ago to shuffle our feet as we enter to warn the rays that we are coming. It is not as if they are there in numbers. They are not. In fact, I have never seen one close to shore. But it is always smart to take precautions. Around noon we figure we’ve had enough sun and head back to our cabana for a shower. 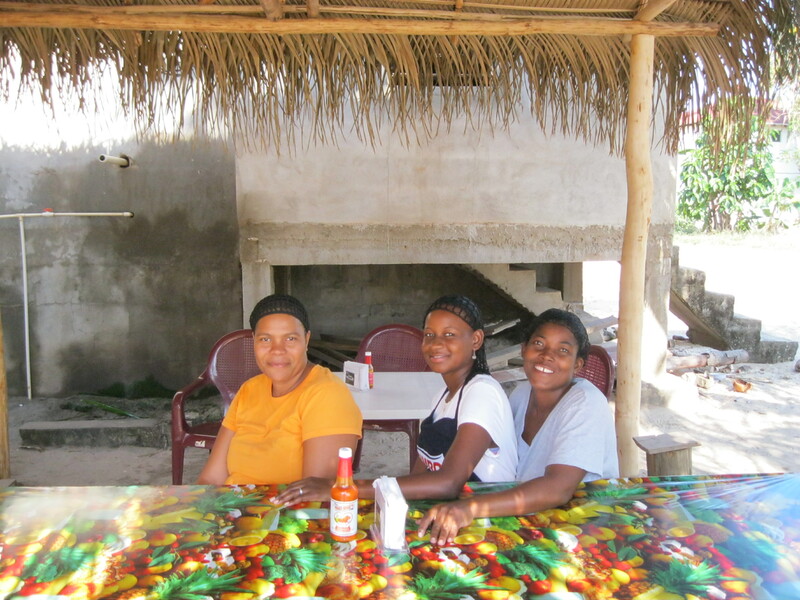 After that, it is time to think of lunch, maybe left-overs from the night before saved in the refrigerator, maybe garnaches, panades and salbutes from Sonia and Lena in their kiosk on the road side, or Tina’s down the road for something Belizean, or up the road to Thongs for salad and sandwich European style. 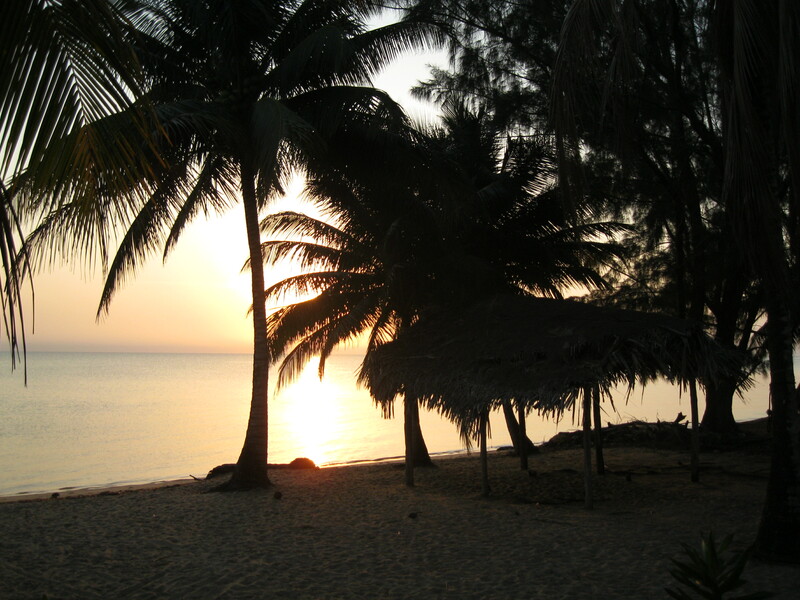 Afternoons drift into walks along the beach, grocery shopping excursions, maybe another swim, conversations with strangers at the Inn or on the street, writing, reading, maybe snoozing under the fan, and then it is 5 o’clock, prime-time for a sun-downer on the verandah, waiting for night-fall. 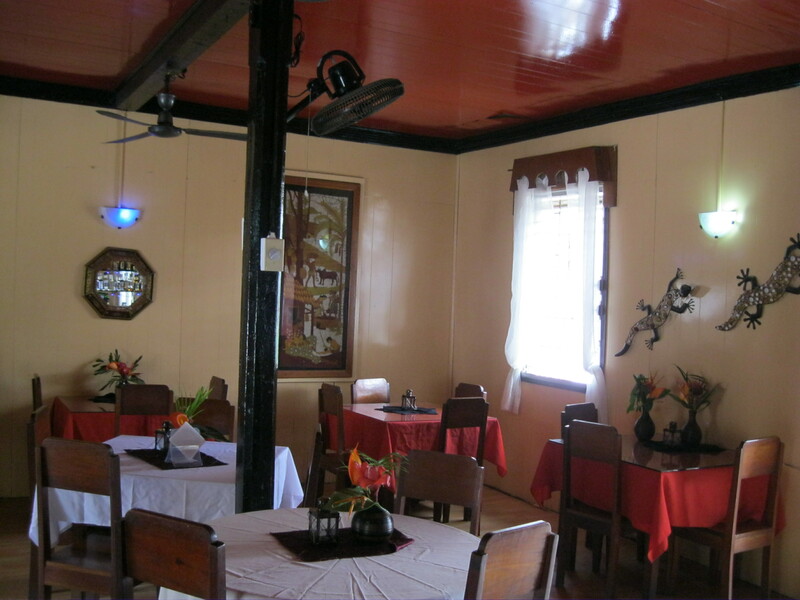 We dined out most evenings, usually nothing special, just good food readily available at the many restaurants on the main drag, followed by a cocktail or two back on the verandah. Luckily, we were able to have several suppers enjoying the company of Greg and Rita at some higher-end restaurants, not expensive but a step up and a nice break from the routine. Evelyn and Greg like their beer and Rita and I like our rum and wine and it wasn’t unusual for us, mainly Greg and I, if we set our minds to it to solve the problems that beset Belize and the rest of the world, only to forget the solutions in the morning, forcing us to re-discover our sage thoughts over and over again.. Lest the reader think there is nothing to do at Hopkins, despair not. 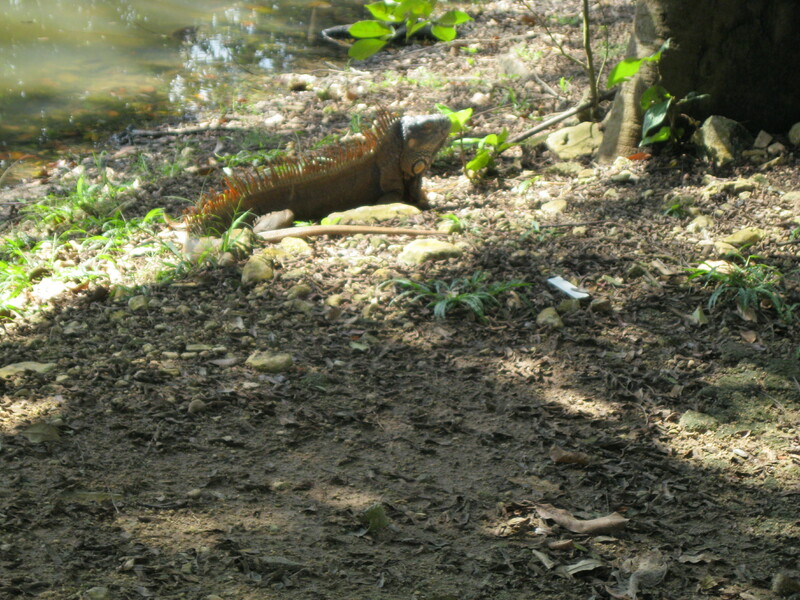 Snorkeling, fishing, zip-lining, bird-watching, day-tripping all await you. Except for the zip-lining which is quite new, we’ve done all these more than once. This time we got a little lazy and the days rushed by and the next thing we knew Greg was driving us into Dangriga to the bus station on our way to another adventure. 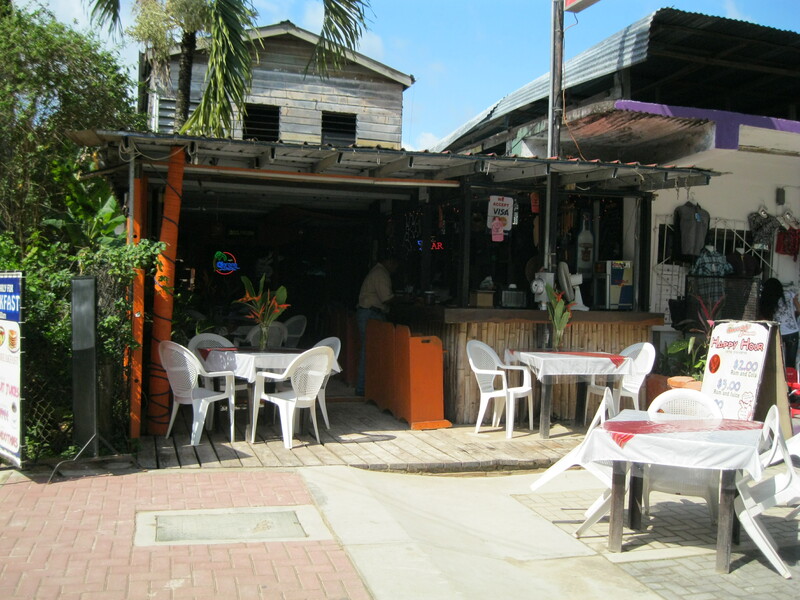 Stay tuned for Belize Adventure 2013 Part 3 when we travel to and arrive on Caye Caulker.